Funded by the Hong Kong Arts Development Council’s Multi-project Grant, Miranda Chin Dance Company will be presenting the multifaceted aspect of contemporary Chinese culture and dance by way of a series of lectures/workshops and exhibitions in various universities in 2009-2010, introducing Chinese philosophy, martial arts, taichi, traditional Chinese medicine, sculpture, wall art, folk dance, literature and Chinese operas, etc., in order that today’s students can experience first-hand and understand the origin of Chinese culture and the development and creation of contemporary arts, thereby enhancing their knowledge of Chinese culture. Chinese martial arts is a unique philosophy of body movements. In terms of space, time and form, it not only assumes the beauty of sculpture and dynamics, but is also a rich combination of solid movements. No wonder Tai Chi is reputed to be the most typical of all martial arts dances. The content mainly introduces the concept of taijirumu (“taichi in dance”), which means the assimilation of the element of taichi martial arts into dance and matching it with different kinds of music to present a new mode of artistic performance. Traditional taichi is consisted of rhythmic motions of various kinds of circles. Taichiquan’s cadence is guiding qi with consciousness and achieving the oneness of form and spirit. “Stillness in motion, motion in stillness. Looks still yet mobile, looks mobile yet still.” Also introduced is the history of the dance company’s creation of the seven episodes of the Wuji series, as well as the relationships between martial arts and Chinese culture. 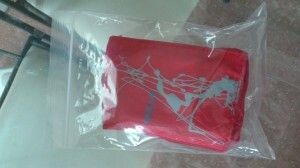 A few days ago I found a wallet when on my way to the Wingchun school. So after the evening lesson I brought it home and wanted to bring it over to the police station the next day, but didn’t know where the station is. So I decided to try contacting the owner by myself. 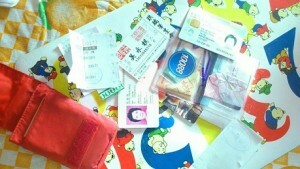 I check the wallet, there was some cards ID and also cash and Octopus card. Then I also tried to find her on Facebook. But couldn’t find her. As I can just read basic Chinese I was asking my auntie’s help to see for clues. She said it is worth at least a few hundred dollars to apply for the missing cards. But then I found a company card, I thought she may be a client of that company and so I was calling. Then they find her and we had contact after a few days. 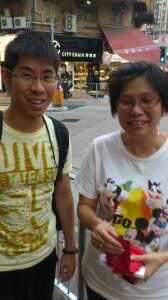 So she took the taxi and rushed to destination and we met each other in Yuen Long. She had a Micky Mouse T-shirt, and I have my dragonstail hairstyle + I was walking with this sack in my hand so it must be very obvious. She was of course happy with the return and we took a picture together which I wanted to share with you. the next day I received a text message from her. She was thankful and suggested to share the photo on Facebook . So she became the 471 Like of my Facebook page. I have added a voting box to my www.facebook.com/alexcheung.nl : What would you do if you see a lost wallet on the street?